From an elegant garden soiree to a high-level business meeting in a specialty suite, The Lowell offers a range of dynamic spaces that serve as a distinguished backdrop to an upscale private event. 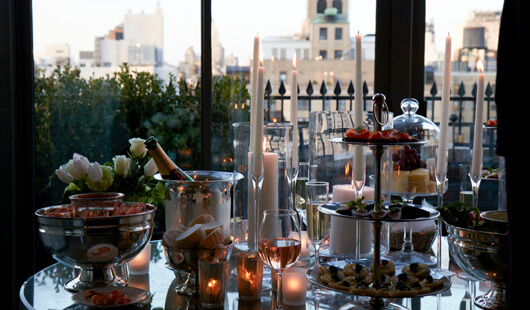 Refined service and gourmet catering flawlessly complement each affair. Five apartment-style suites, featuring distinct decor, large dining tables and private terraces with city views, provide an ideal setting for a board meeting or special celebration. The Lowell’s storied Pembroke Room, rich in Renaissance splendor, sets a magnificent stage for a private brunch, afternoon tea, cocktail function, or private dinner party. For a sophisticated gathering, the hotel’s new Club Room welcomes guests with comfortable luxury. Deep sofas, wingback club chairs, and a seamless extension to Majorelle’s pristine Garden, offers one of the most spectacular spaces in all of New York to host an event.